When the materials and inspiration are composed of first love, first love can prove a tricky foundation to build upon. Swedish duo Sally Shapiro (he, Johan Agebjörn, she, anonymous and adopting the band name for a pseudonym) fabricated their debut Disco Romance out of a shared passion for shy crushes and the cool, controlled Italo Disco of Giorgio Moroder and Valerie Dore. Hardened critics fell hard: a pixie dreamgirl with no manic side whatsoever cooing rollerskating songs about holding hands and romantic longing over Autobahn basslines and sweetly arpeggiated synths. A dash of mania, however, leads to the unpredictable and the unexpected. Growth and evolution. Granting few interviews and opting not to tour, Sally Shapiro’s winsome vision of love and friends and perhaps maybe possibly something more than friends became frozen in time—trapped in a snow globe—every shake a lovely but diminishing reminder. After fatiguing Disco Romance with endless remixes, Sally Shapiro’s proper follow-up, My Guilty Pleasure, was pleasing and professional in every way and in every way something of a letdown. How could it not be, given the rare and fleeting emotion it hoped to recapture? 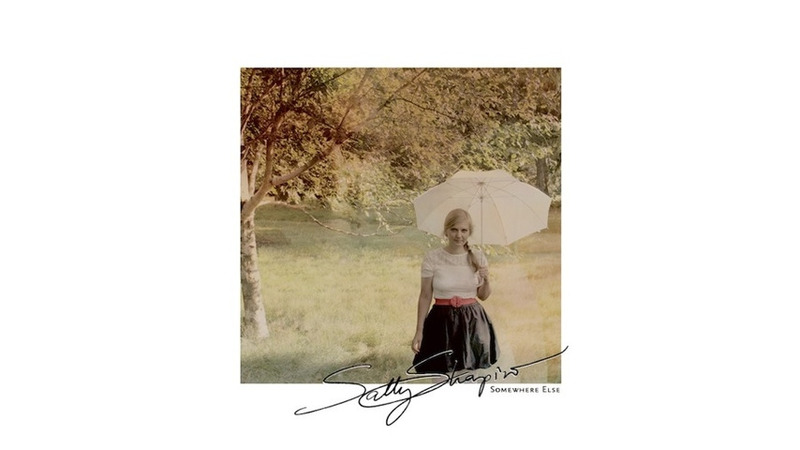 In Somewhere Else, Sally Shapiro dip from toe to calf in new soundscapes and are enlivened by the feel. Reveling in a prismatic Bernard Sumner riff, “All My Life” cuts loose as Shapiro lets her voice soar toward… well, perhaps not exactly ecstasy, but certainly more wide-open territory than she commonly dares. Welcome flashes of humor crack the surface in “This City’s Local Italo Disco DJ Has A Crush On Me,” as Shapiro speak-sings the narrative and appears to wink at both Madonna’s “Lucky Star” and fellow Swede Jens Lekman’s “Friday Night At The Drive-In Bingo.” Meanwhile, “What Can I Do” ditches the disco altogether, pedaling off on a cobble-stoned path of Belle & Sebastian flutes and strum. Agebjörn’s 2011 solo turn, Casablanca Nights, largely flew under the radar but appears to have opened new sonic vistas. Shapiro provided guest vocals on several of the album’s strongest tracks, and without the parade of bouquet-holding admirers waiting for the next “He Keeps Me Alive” or “I’ll Be By Your Side,” the pair freely indulged a side that was… well, perhaps not exactly manic, but certainly more campy, offbeat and sensual. A few drifts of the contemplative piano from Casablanca Nights would have been a welcome addition to Somewhere Else’s light atmospherics, but Agebjörn does revisit other avenues from that album, again collaborating with Stockholm DJ Le Prix and sending “Architectural Love” billowing into Lindstrøm spaciousness. Electric Youth (featured on Drive’s “A Real Hero”) guest on the twinkling “Starman,” while the instrumental “Postcript” could have soundtracked one of that film’s insular, late-night rides. As should be expected, every new look isn’t uniformly flattering. “Lives Together” accelerates toward the lofty art pop eccentricity of Kate Bush and Mylène Farmer, but ultimately loses its nerve and coasts along at a safe cruising altitude. Velvety soft rocker “Sundown” goes all-in with Kenneth Gorelick sax—and if that wasn’t inadvisable enough on the face of it, that Songbird-smooth becomes even more disconcerting as the boudoir trappings don’t vibe at all with a trademark Sally Shapiro lyric of unsent letters, missed chances and the sort of love that never quite blossoms. Given the amount of time Sally Shapiro spend blushing at first base, an all-out bell-ringer may be beyond the duo’s reach. Nor is one completely necessary: “I Dream With An Angel Tonight” revisits both unrequited love and ethereal disco and magically evokes everything that first made Sally Shapiro so beguiling. Over a static-y, crepitating beat, Shapiro fully articulates her Scandinavian lilt, lingering over each accented /t/ as she sings: “this story was never intended to be/ and you were never intended for me.” A twirl of the hair, a trick of the light, a syllable pronounced just so and in a torrent of noticing everything about first love rushes back: and after that glimpse comes everything that happens next.